In the crazy, distracting and hectic world of today there is an endless supply of sources of stress. If you can find the time, then searching out the most beautiful places to fish in the USA can go along way to limiting the stress. Fishing promotes emotional well-being and provides an excellent way to spend your free time. As a matter of matter of fact, many professional health practitioners and psychiatrists recommend fishing for rehabilitation. Statistics suggest that over 50 million adults and children in America enjoy fishing, thereby, making it one of the most popular recreational activity among Americans. But fishing is not just about the fish, it is also about families and friends relaxing together and enjoying the great outdoors during a fishing trip. Although you can fish in countless locations across the United States, some places are head and shoulders above the rest for their exhilarating, beautiful scenery. Whether you’re looking for an outdoor vacation spot or a fun destination, these places will make your fishing trip unforgettable. So, grab your rod, line, reel, hook, and bait and get ready to practice your lure fishing, fly fishing, and bait fishing techniques. Here are our seven most beautiful places to fish in the USA. Renowned for its beautiful scenery and trout abundance, the Bighorn River is regarded as one of the most beautiful fishing streams not just in Montana but the entire country. Though localised to the first 13 miles, the river offers fly fishing enthusiasts an opportunity to fish for the whole year. Yes, even including in the middle of winter. This stretch has a population of about 3000-5000 fish per mile, with a considerable portion of the fish being over fourteen inches. The river mostly harbours brown trout, but prized rainbows are also abundant. The best fishing period is during the summer between July and September, but anglers are present even during the cold, dead of winter. Since the 1920s, the Outer Banks has always been a hot tourist destination, with anglers from all the states flocking to coastal North Carolina all year round. It is renowned for exceptional and adventurous fishing. Whether you’re booking a boat for an off-shore fishing excursion, casting off the beach or fishing from any of the several fishing piers, you will surely have a fantastic time. The most popular type of fishing is beach fishing since virtually any stretch of the beach is a lovely spot. Many seasoned anglers prefer head boat fishing, and the boats take them to popular places for sea bass, trout, and much more. Charlotte Harbor is one of the top sport fishing destinations in the world. With over 129 square miles of fishable waters, the spot boasts numerous top species including tarpon, snook, redfish, bluefish, cobia, jacks, and king mackerel. The place is a blend of fresh water from the Caloosahatchee, Peace and Myakka rivers and salt water from the Gulf of Mexico offering an excellent ecological breeding ground for the different species. Charlotte Harbor is ideal for all types of fishing including fly fishing, freshwater fishing, saltwater fishing, deep sea fishing, back-bay fishing, and kayak fishing. It offers fantastic fishing opportunities all year. Therefore, make sure you add this spot to your list. Popularly referred to as the “Salmon factory of the world,” Bristol Bay, Alaska offers beautiful scenery, stunning wilderness settings, and exceptional freshwater fishing opportunities. It is a hot spot for five species of salmon including chum, king, sockeye, silver, and pink salmon, as well as other freshwater fish species. Bristol Bay has numerous fishing retreats including Bristol Bay Lodge, Bristol Bay Adventures, King Salmon Lodge, and Alaska Fishing Lodge. The place also offers other fun activities such as bear spotting. A weekend spent in Bristol Bay is fulfilling and will leave you with unforgettable memories. With a 125-mile long arc of islands, the Florida Keys provides a unique fishing environment that makes it a must-visit. The Florida Bay harbours five of the most sought-after game fish including tarpon, bonefish, snook, redfish, and permit. As you drive down the southern coast of the Sunshine Coast, you will see breathtaking scenes of the blue and green waters surrounding the top fishing destinations like Key West, Key Largo, and Islamorada. The fishing seasons correspond to the movements of certain species passing through the Florida Keys, but there’s excellent fishing all year round in superb spot. This spot is undoubtedly and often voted one of the most beautiful places to fish in the USA. With many shorelines and unique culture, Thousand Islands is a must-visit fishing spot for every angler. Countless species of fish can be seen swimming around the island from muskies to perch and bass. This place is a anglers paradise and an excellent destination for a unique fishing trip. Just like the name suggests the spot has a diversified environment with fishing options ranging from small tributary rivers to Lake Ontario. This spot offers anglers the opportunity to try out different fishing techniques and tactics. Also, there are many fishing tournaments held here, so you will surely be in good company and have a wonderful time. The Colorado River is a wide and slow-moving river with many sections and is home to a flourishing population of brown and rainbow trout. It offers remote water stretches with great hatches and magnificent scenery along the river corridor. The beautiful Glenwood Canyon provides an ideal spot for bank fishing, and the recreational path makes it easy to fish across any section of the river. The river also offers a great place to see Southwestern wildlife as you fish, especially in the Grand Canyon National Park. You may come across mule deer, black bears, pumas, and bighorn sheep. 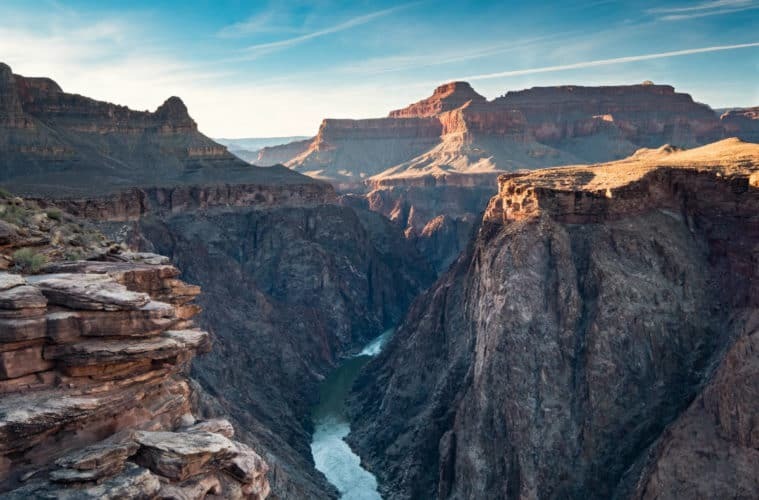 The Colorado River also offers other exciting activities such as camping, hiking, and rafting, making it one of the best spots for the adventurous fisher and in our opinion one of the most beautiful places to fish in the USA. Fishing is a perfect opportunity to take a break from your routine and do something that you enjoy. It offers you a chance to get out and experience nature’s fantastic scenery. Visiting a new location provides a unique experience and provides you with unforgettable memories. Therefore, make an effort and explore the magnificent view that mother nature has on offer. Take a group of friends or family members and visit these stunning spots. You will surely enjoy the gorgeous views while you explore the waters! So, what do you think of our list? Can you recommend any other great fishing spots? What do you think are the most beautiful places to fish in the USA? If you have an idea, then let us know in the comments below.